Terrorism is the use of force, fear and/or violence by a person or group to intimidate or coerce societies or governments. Terrorism often has political or ideological motives. These attacks can take many forms and could happen anytime and in any place. If a terrorist attack occurs, you will be given instructions from public officials. In the meantime, there are a variety of steps you can take to keep your family safe. The U.S. Department of Homeland Security defines an "active shooter" as an "individual actively engaged in killing or attempting to kill people in a confined and populated area." If you ever find yourself in an active shooter situation, remember to run, hide and (as a last resort) fight. Hide in an area out of the shooter's view. Attept to incapacitate the shooter. 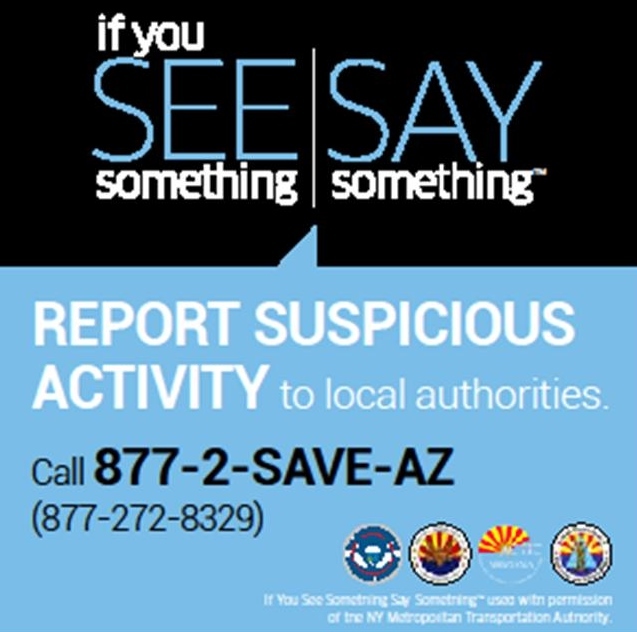 If You See Something, Say Something™ is a national campaign to raise public awareness of the indicators of terrorism and terrorism-related crime, and the importance of reporting suspicious activity to state and local law enforcement. Informed, alert communities play a critical role in keeping the Whole Community safe. Some of these activities could be innocent; it's up to law enforcement to determine whether the behavior warrants investigation. The activities above are not all-inclusive, but have been compiled based on studies of pre-operational aspects of both successful and thwarted terrorist events over several years.